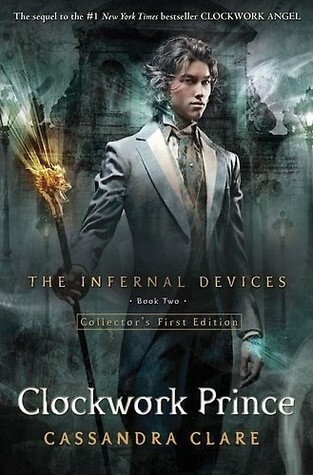 Clockwork Prince Author: Cassandra Clare Series: The Infernal Devices, Book 2 Date read: 26 April 2016 Times read: 1 Rating: 4/5 stars Book page The second book in this series was absolutely interesting, even a bit more than the first one. After I finished “Clockwork Angel” I was tempted to start reading the next book, and so I did. I can say that I’m absolutely glad that I have all 3 books in my digital library, so I am able to start the next one right after the previous. In “Clockwork Prince” we can see more the relationship between the characters living in the Institute than an action coming from the Magister, which I think gave us the opportunity to understand more about them. As well as Tessa I’m also bound between Will and Jem. Both of them are awesome. Will for example is so beautiful and so damn evil at times and I’m glad that I was able to understood the truth about him. It was really painful to live a life like this. His struggle was so big, but in the end he finally understood that he have to stop hurt himself and the others, and that he will be able to live a better life. Jem is sweet. My heart hurts knowing that he is going to die after all. And also I thing in my mind that wants to tell me something about him, but I don’t remember. Anyhow, I like his character – the fact that he knows that he is going to die, but he keeps living and being so good and kind person. Tessa is something very interesting. I like her. I can’t stop compare her with Clary from TMI series and I can’t hide it – I prefer Tessa. She’s yet to understand what she really is and I have that feeling that she have something to do with the fairies. In this book I was drawn to another interesting character. Gideon Lightwood slowly enter my heart and even though he is not from the main characters, I started to like him, which I cannot really say about his brother Gabriel. I must add that I’m also impressed and even more in love with Magnus Bane, but this is something that I’ll probably keep writing as well in the future. The book ended wide open and my interest just wasn’t able to stay still, so I’m 100% sure that the next book in my to-read list is “Clockwork Princess”. I want to know more.